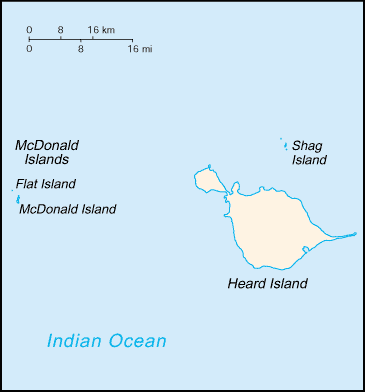 Heard Island and McDonald Islands  are uninhabited, barren, sub-Antarctic islands in the Southern Ocean, far due south of India and roughly 200 miles southeast of Kerguelen of the French Southern and Antarctic Lands. The islands are administered by Australia. There are two structures on the island, a ruined sealers hut near Oil Barrel Point, and an apple hut of unknown condition at the northern end of Atlas Cove. This page was last edited on 4 September 2018, at 08:44.